Size: Select 1 oz. 16 oz. 2 oz. 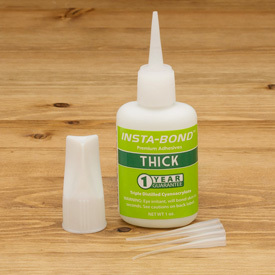 Insta-Bond™ Premium Thick CA Glue is an extra thick gel-type CA adhesive recommended for bonding separate pieces such as waste blocks to bowl blanks, pen and project tubes, and mixing with sanding dust to fill holes and voids. Can also be used for inlay work where more positioning time is needed. Comments On Oct 28, 2016:works great for inlay work as a much faster alternative to epoxy when used with an accelerator. premix with crushed rock etc in small batches it sets up quickly. i would not personally recommend this for laminate type work as the epoxy has superior strength. Comments On Jul 16, 2016:Works very well for gluing mushroom birds on birdhouse ornament perch. Thick so it doesn't run. Love it!